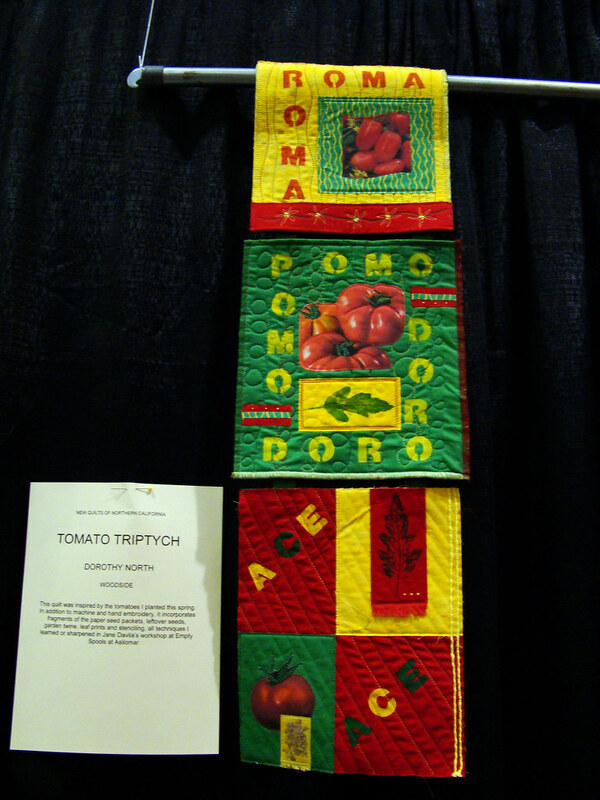 For my next-to-last post about the Pacific International Quilt Festival of 2009, I will show you some of the spectacular entries in the wall quilt category. 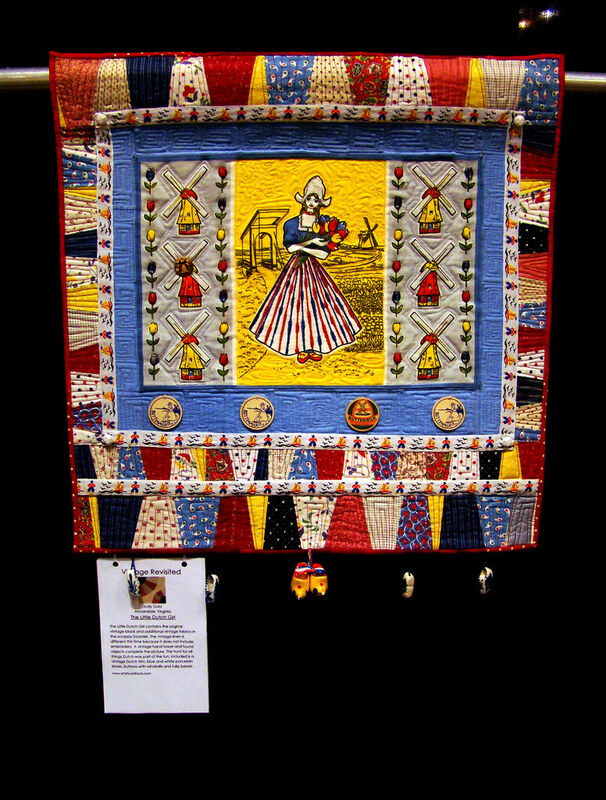 Janis Arredondo did not get an award for this quilt, but she gets a blue ribbon in my book. 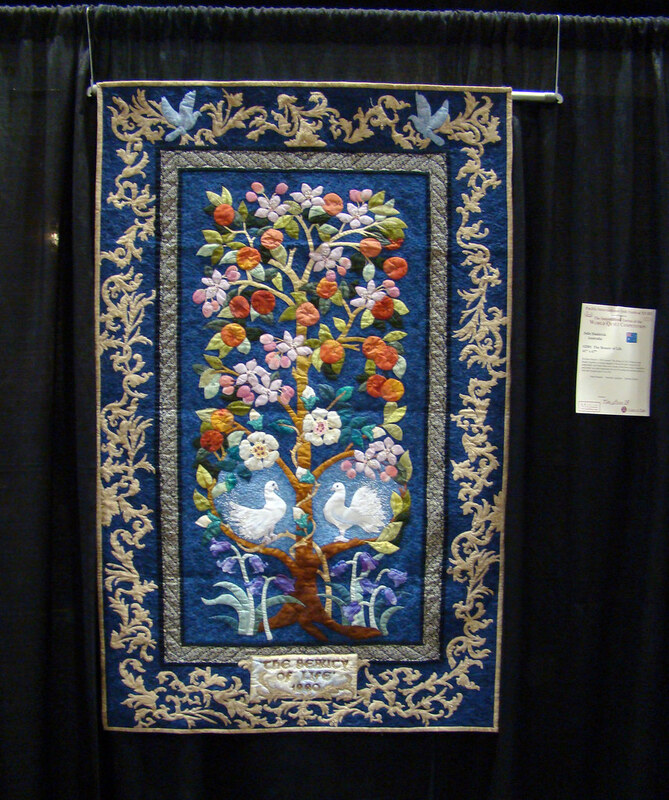 I love the composition of this quilt and the exquisite botanical detail of the flowers and their foliage. My mother observed that the edges of the fabrics were not turned under thus giving a very flat finish. 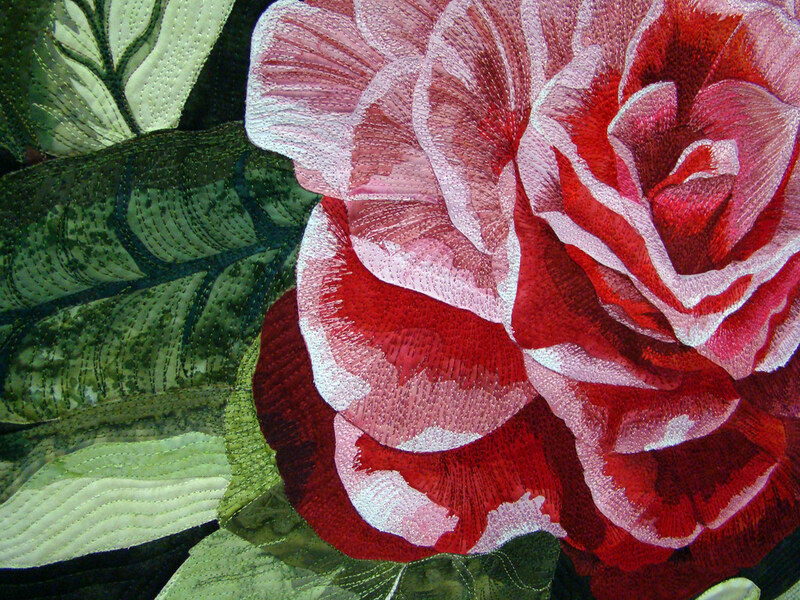 Since there is so much machine embroidery and the fabric was cut so close to the stitching, there is no danger of raveling. My mother very excitedly declared that she was going to do the same thing on her quilts. She always had difficulty with turning the fabric under without it pooching out in places, especially around the curved edges. As sewing machine technology improves, it opens the door to more creativity than ever. 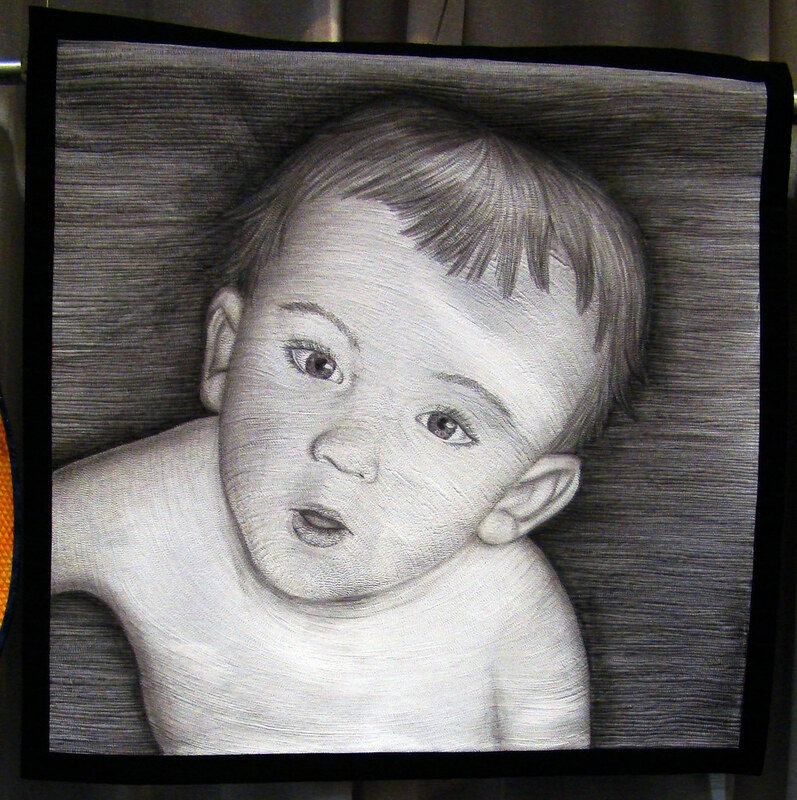 Tanya Brown froze a summer moment of “Brian at 10 Months” using unbelievable machine embroidery skills and Tsukineko ink. I am often attracted by bolder designs, especially in quilts, but this little wall quilt pulled me in from far away. Thom Atkins had to shift his medium of expression from bronze sculpture to textile arts after suffering injuries to his wrists and thumbs in a traffic accident. He printed Photoshop-manipulated photographs on fabric and reinforced the image with waterproof Sharpie pens. 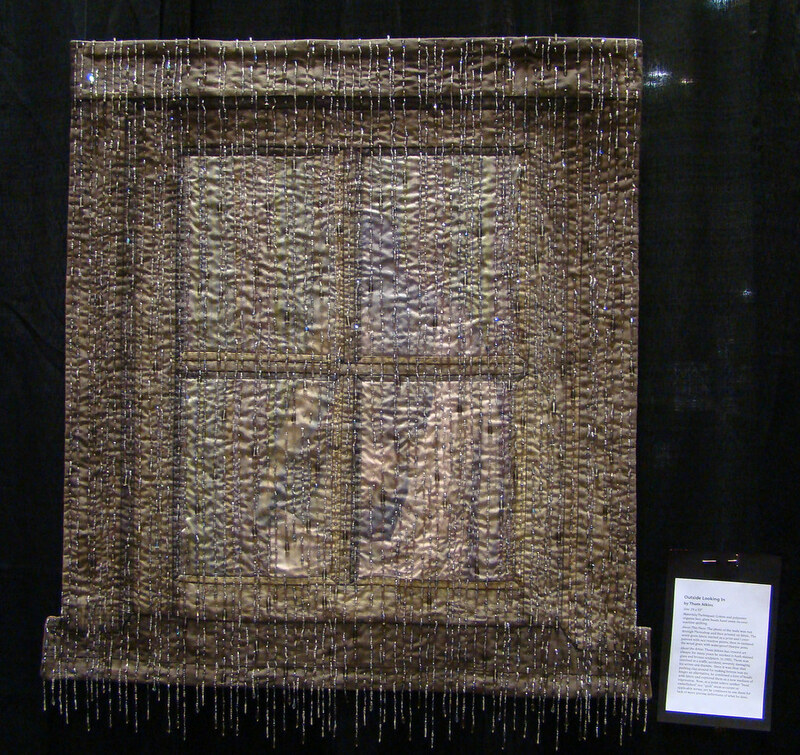 My favorite element of the quilt is illusion of rain created by the shimmery threads of glass beads. I can’t help but think that this quilt is a metaphor of the terrible traffic accident. Though I’m sure the injuries that deprived him of the ability to work with clay were a rainy day in his life, from it a thing of beauty and a new passion emerged. 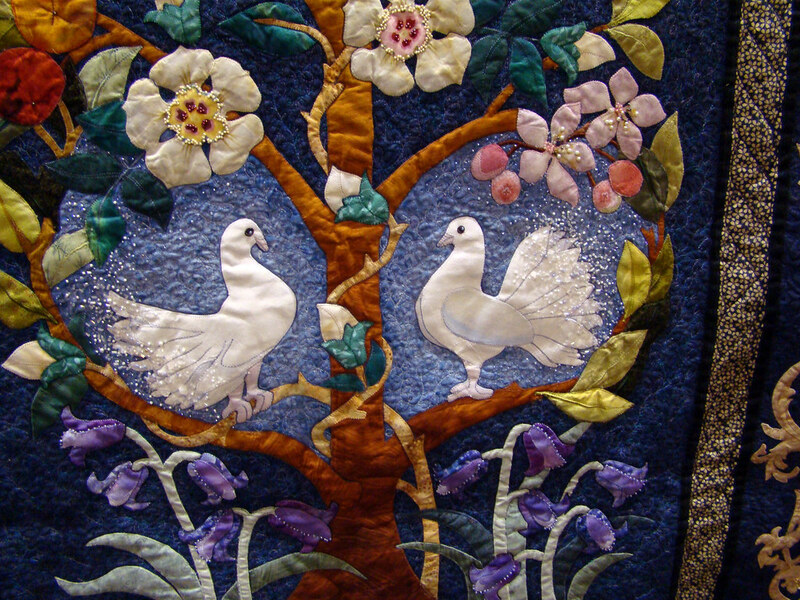 I was glad my mother pointed out he beautiful doves in the quilt called “The Beauty of Life”. 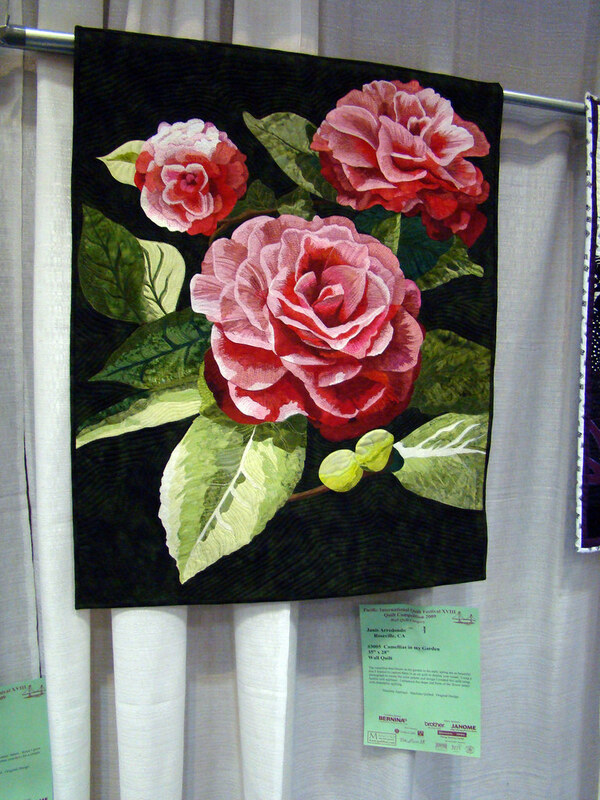 My photo was too fuzzy to make out the last name of this quilter from Australia. The first name is probably Julie. 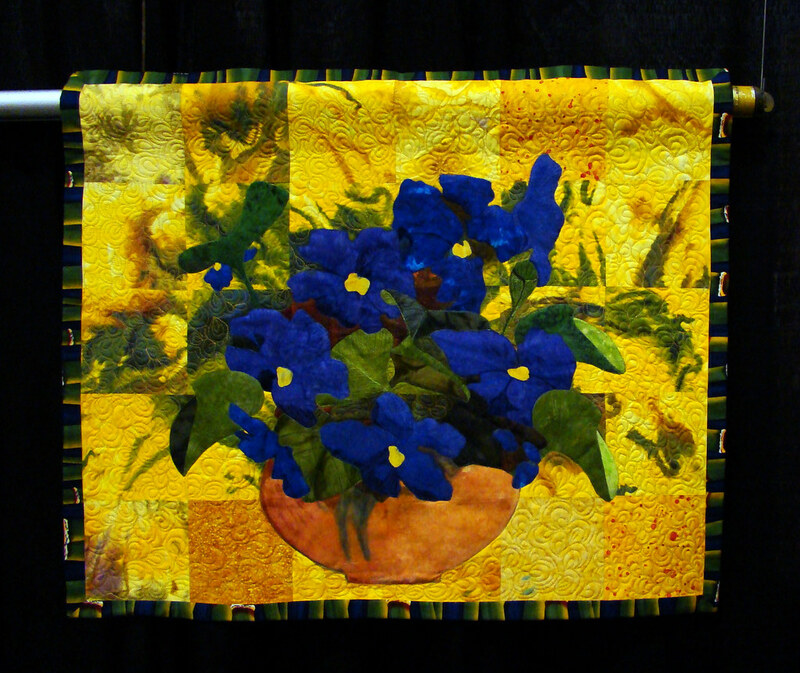 The last wall quilt I will feature here is a single square that is the ultimate Dutchbaby quilt. We came upon this little beauty in the “Vintage Revisited” section. “The Little Dutch Girl” by Judy Gula contains vintage fabrics and notions plus tiny ceramic and wooden “klompen” dangling at the bottom. You may view all my posts covering this quilt fest here, my 2009 Quilt Fest flickr set here, and last year’s here. It just amazes me the wealth of talent in this world! These are all winners in my book, too. Love the Dutch one. Lovely quilts! I wish I had time to do the quilts I have started. Yes, I'm very interested in that series. It is such a unique, wondrous experience; thank you for sending me there. I read it on my iPhone this weekend but I'll be back shortly to leave some comments. These quilts absolutely give me the shivers. Especially that first one. 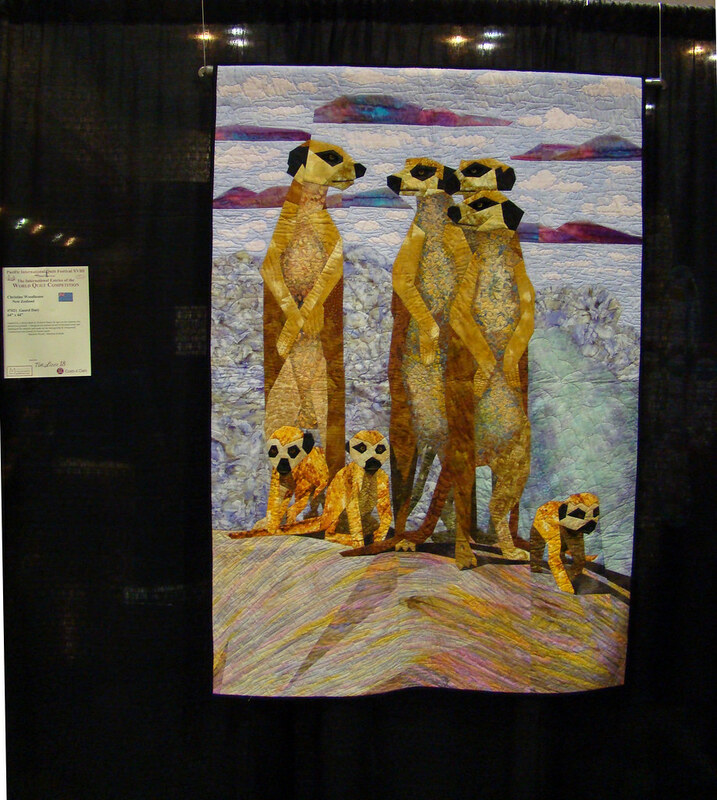 Some day I am hoping I'll see these quilts in person. With you and Oma. How fun would that be?? ?